After opening Kotak 811 Zero balance saving account online, you get the Virtual Debit Card. You can see this virtual card after login to Kotak mobile banking application. 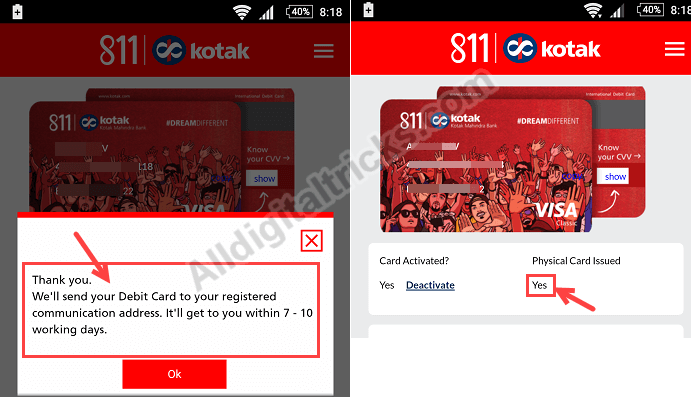 Now you can also apply for kotak 811 Physical Debit card. Virtual Debit card only works for online so if you want to use your card at ATM or POS then you can apply for physical Debit card. Let me tell you first, 811 Physical Debit card issue charge is Rs.199+tax and then you will charges Rs.299 every year. This card is VISA International Debit card. Virtual card is free but if you want physical Debit Card then you will have to pay its annual charge, which usually levied by all banks. Let’s see how to apply for this card online. 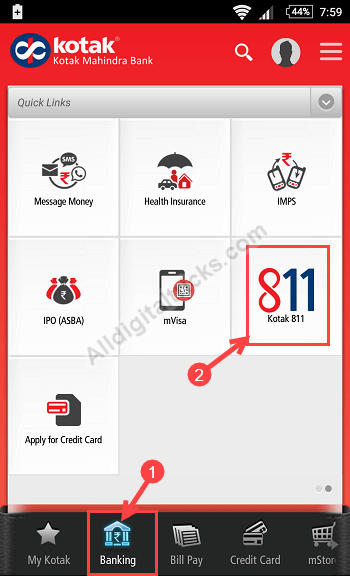 Once the 811 account is open, you can access your account at Kotak Mobile Banking Application, which is available on Android, iOS, Windows Phone. 1: Login to Kotak Mobile Banking first. 2: After logging in, you have to tap on Kotak 811 in the Banking tab. 3: Next screen you can see your Virtual Debit Card with card number, expiry date and CVV number. To apply Physical Card you have to tap on “Get one now” under “Physical card issued“. 4: That’s it, you have successfully applied for your Kotak 811 physical debit card. You can see success message. Your card will be delivered to your home address within 10 days. You will also receive PIN number separately. Rs.199+tax will be debited from your account. After getting your 811 physical Debit card , you can generate its pin through mobile banking and Net banking. So in this way you can order your kotak 811 Physical Debit Card. 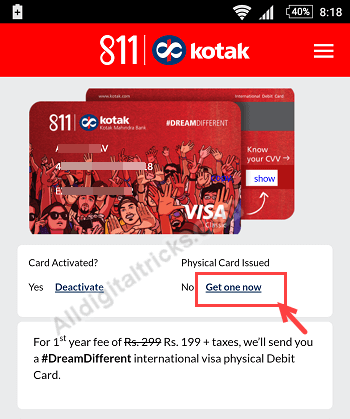 Remember other kotak saving account holders can also apply for this 811 account including debit card. Hi, I have opened Kotak 811 account recently. When i am trying to apply for Debit card in mobile application then the debit card symbol is showing locked. How can I apply for Debit card? Please guide. please complete full kyc by visiting your branch, after this you can apply for debit card. I received my card within 10 days after applying. You can ask on twitter for details. I received my card, it will cost you Rs.234, so please keep minimum Rs.240. This card is International and working almost everywhere. But if i do any online payment it required cvv2. Its not showing virtual debit card in 811 widget in banking section….it only shows the option to add fund in account. So how can i enable my virtual debit card? Please wait for some time. Make sure kyc done. You can contact bank. I have kotak saving account already so my account 811 opened instantly without following process. How to se status of your debit card because I did order a month ago but still haven’t received the card. I also applied 811 debit card and received within 10 days. Please contact kotak customer care through Twitter or call them. Hello sir, i have kotak saving account also so after opening 811 account my full kyc done. As you can see in screenshot option available in my application. Possible that you need to complete full kyc, or it is temporary error, maybe available after sometimes. Please contact kotak via twitter or call. Bhai mujhe communication address par physical debit card mang wana hai to kese hoga btao? ?